23 November 1963: The first ever episode of Doctor Who - An Unearthly Child - is broadcast. 23 August 2014: Deep Breath is Peter Capaldi's first full episode as the Twelfth Doctor. For over half a century, Doctor Who has entertained and enthralled fans with the time-travelling adventures of the Doctor. From the first glimpse of a police telephone box in a Totter's Lane junkyard to the fall of the Time Lords' home planet, Gallifrey, Doctor Who has provided a near-inexhaustible list of indelible memories. 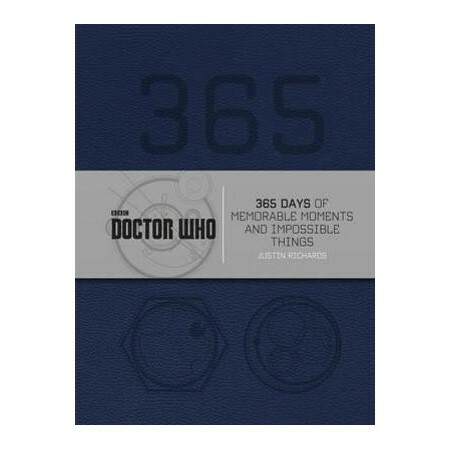 Doctor Who: 365 is a unique and captivating chronicle of those moments - flashes of drama or humour, terror or joy, for each and every day of the year. Revisiting classic battles, thrilling escapes, iconic characters, game-changing plot twists and more, Justin Richards creates a fascinating portrait of the world's longest running science fiction series, and an essential addition to any Doctor Who fan's collection. A celebrated writer and Creative Consultant to the BBC Books range of Doctor Who books, Justin Richards lives and works in Warwick with his wife and two children. When he's not writing, he can be found indulging his passion for inventing, reading and watching far too much television.